I went to the Detroit Zoo with one thing in mind and left with another thing to take its place. The new beaver exhibit was done and I thought it might be fun to catch the critters in action and get a few detail shots etc. That was my intention, anyhow. Never mind that I’d read that the new beavers, Ward and June, were “shy” and that they were basically no-shows for the visitors. Someone else told me the same story personally, yet I persisted. I went anyway and was not disappointed in being disappointed. Not only were the beavers in absentia but it appeared, based on the wilting lettuce and un-chewed cottonwood branches placed out for them, that they had not been out for some time. There were plenty of fat Rainbow Trout swimming in the viewing pond but no beaver. It was a great Rainbow Trout exhibit. I will not blame the keepers for the faults of their kept – beavers are basically nocturnal critters (it was daylight, by the way) and, who knows, perhaps the Beavers were inside the lodge making little cleavers! The Red Pandas were also in hiding, so they were not the only ones being anti-social. The lack of living beavers prompted me to look at the labels. I’m ashamed to admit it, but as a person who once made his living writing labels I rarely read them unless forced by circumstance. Beaverlessness was just such a circumstance. I shouldn’t have done so. I watched as hordes of small children charged the underwater viewing window screaming bee-er, bee-er (meaning beaver, not refreshment) and changing their chant to bish, bish (small childeese for fish). Their helpful parents, seeking to salvage the experience, would look up and read the large label that says something to the effect that “if the beavers are not out, then look up at the monitor and see what they were doing last night.” I did the same thing after I charged the glass and saw the invisible beavers. Apparently Sir David Attenborough and a set of mountains were in the beaver enclosure the previous night. The video showed beavers in a mountain pond setting with background narration and music. In one segment there was a grainy black and white night camera view of the interior of a lodge with “beavers” moving around. “Look”, cooed one mother who happened to look up just as this sequence was playing, “there they are!” The problem was that the pictured “beavers” were actually muskrats taking up lodging in a beaver lodge. The distinctive voice of Sir David could be heard explaining that “no one is really sure if the beavers much care about these interlopers but…” Our mother’s excitement faded off when she realized that it was only a documentary movie and she hurried her children off to the Red Panda exhibit. The experience all fell apart upon looking at the other labels. 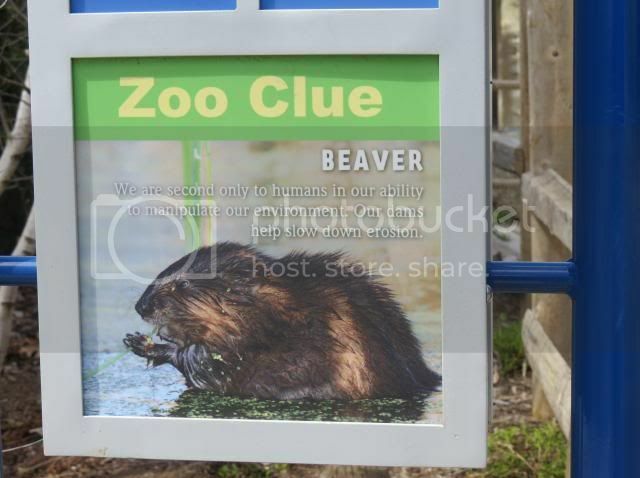 The photo illustrations used to depict the fascinating lifestyle of Castor canadensis implied that beavers are able to morph into Nutrias and Muskrats during the course of their daily lives. Perhaps the muskrats in the Attenborough video actually were beavers in disguise – fooling even that seasoned old naturalist. When asked to display their ever-growing front incisors, the beavers turn into Nutrias and fool everyone else into thinking they are illegal immigrants from South America. 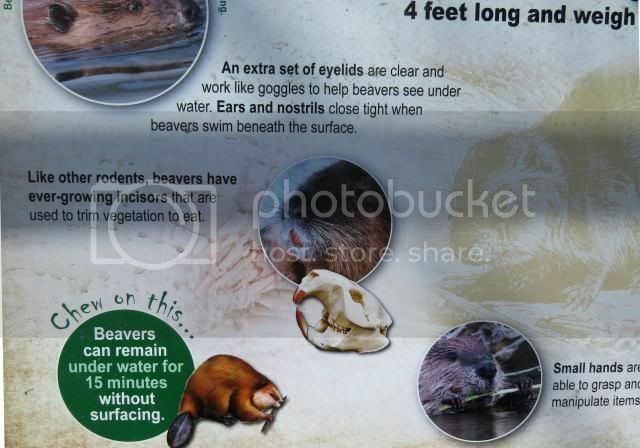 You might recall an earlier post in which I blasted the Detroit Zoo’s magazine for using Nutria pictures to illustrate their article about the up-coming beaver exhibit last year. 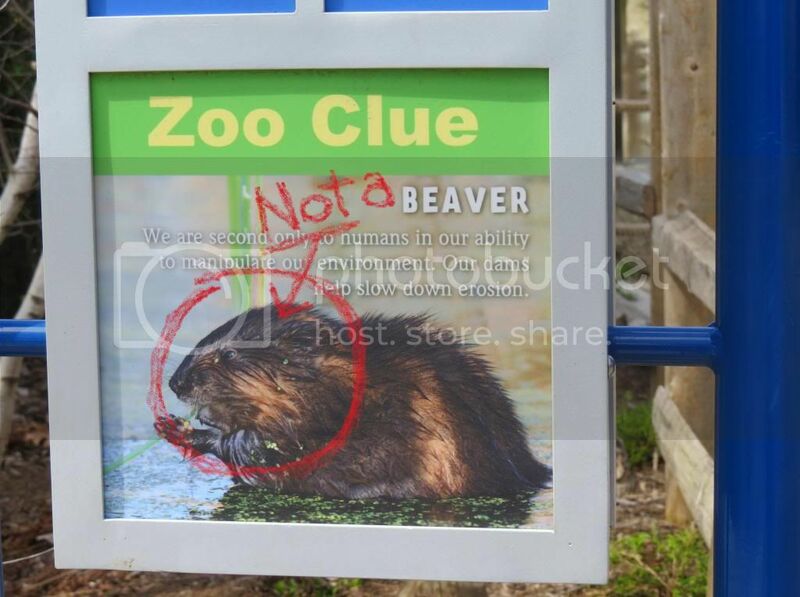 Simple mistake, I thought…stupid mistake given their obvious differences but zoo people and editors (at least most of them) are human and prone to mistakes. Certainly this was a “one off” thing. Well, it wasn’t. There were two Muskrat photos (see beginning photo and below) and one Nutria portrait (see toothy beast above center) on the beaver display panels. Remember, this is a brand new exhibit minted in 2013. There is no excuse for this. None. This is what happens when Jr. High students are enlisted to make labels based on Wikipedia articles and not professionals. Is it really that hard to tell the difference between a Muskrat, Nutria, and a Beaver? Really? Zoo educators don’t seem to have the same issue when differentiating the African and Chilean Flamingos. Nor would they dream of putting a Black Rhino photo to illustrate the White Rhino exhibit. Beavers have been known to do a pretty good imitation of Chilean Flamingos when trying to spy on Nutria colonies in South America, so I’d advise that the zoo personnel to be very careful. So as not to seem like a curmudgeon, I must say that I was fully impressed by another display at the Detroit Zoo. 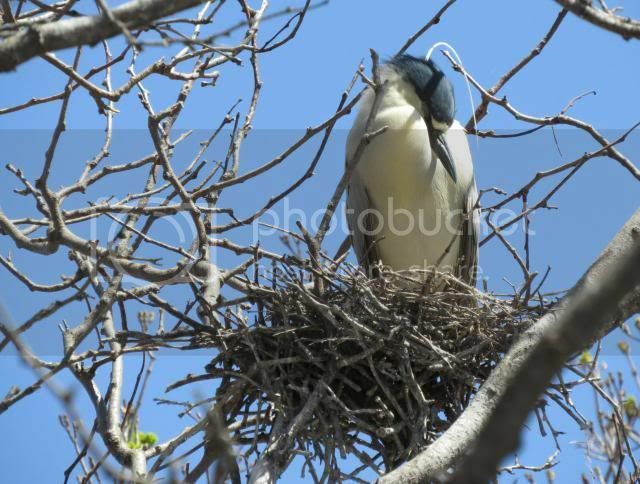 There is a free-ranging colony of Black-Crowned Night Herons near the Sweet Treats concession stand. These are wild birds and not part of the caged crowd. 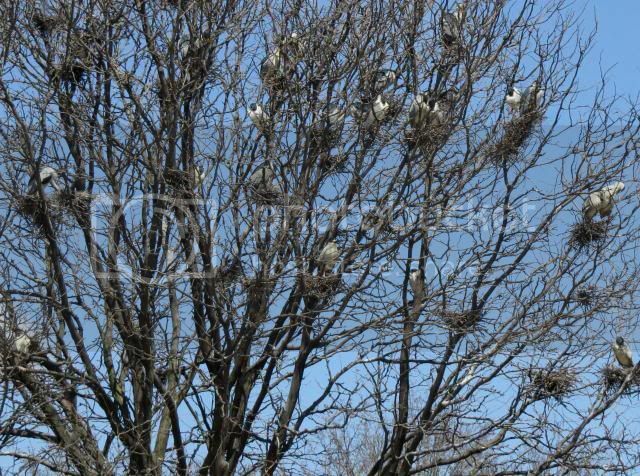 An excess of 60 of the pint-sized herons have returned to the rookery and are ready to resume the breeding season. One of the docents, exuding much more accuracy than the beaver labels, said that the birds returned last week. The rookery has been an annual feature at the zoo for nearly a decade. While the pavement under the trees may be a dangerous place to stand, one can view the birds if you stand off to side and gawk. 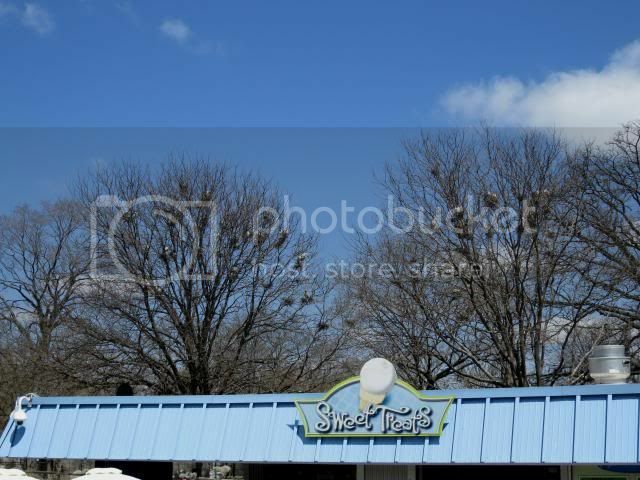 Most of the human visitors were not aware of this colony when first approaching the concession stand but most wised up upon seeing the white-wash zone beneath it. Several warned their adventurous children not to stand in this “danger zone” but I noticed a few kids daring each other to do exactly that. The herons (at least I assume they were herons and not beavers) were not in an especially poopy mood on this day but I can imagine what things will be like later in the spring when young are in the nests. 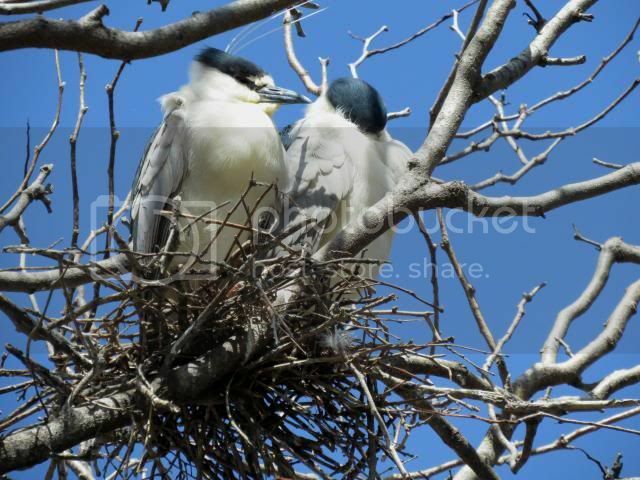 During my visit they were apparently re-establishing pair bonds and claiming nest platforms. Some were shifting a few twigs about, but most were engaged in preening or snuggling side by side with their prospective mates. A cold wind prompted them to tuck beaks deep into their breast feathers – their ornamental head plumes sticking up like Dr. Seuss characters. 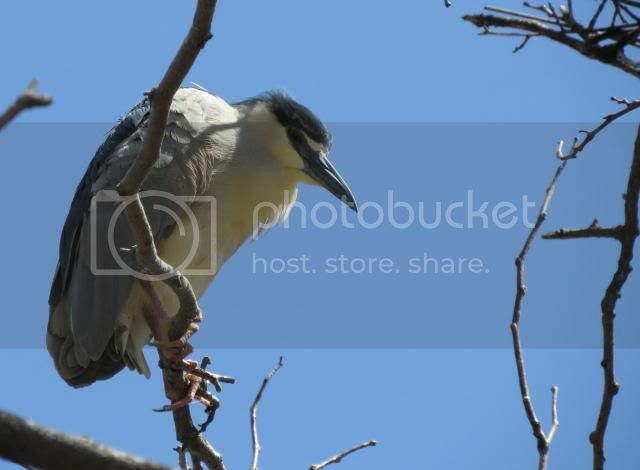 Like the beavers, Night Herons are mostly nocturnal and one would have to be in the park at night, along with Sir David, in order to catch them flying off to feed in the zoo ponds. Unlike the Nutri-beavers, they are worth the entry fee. There are places one may expect to find pelicans and places where you wouldn’t. If you are a regular reader of my blog (a trait that should qualify you for sainthood) you’ll recall that I expressed a northerner’s fascination with the Brown Pelicans around Tampa region. I expected to see them there and there they were. 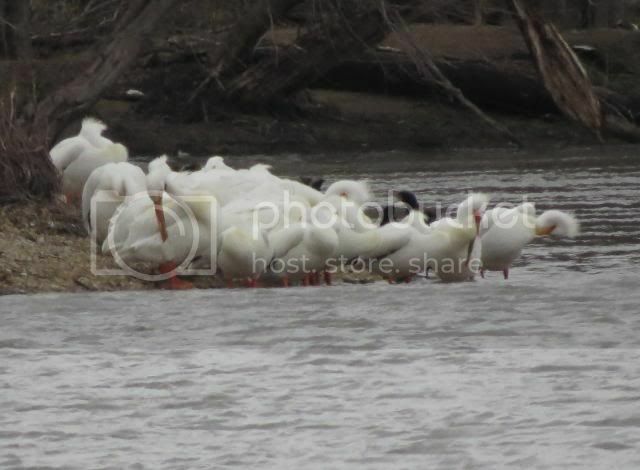 I did not expect to see White Pelicans in Illinois last weekend, although I probably should have. I’ve seen a few of these monstrous white oddities in Michigan over the years. A few individuals (sometimes up to dozen strong) show up on rare, but regular, occasions at the Pte. Mouillee State Game Area in S.E. Michigan. One can never expect to see them there but their appearance is not totally unexpected. I spotted two there last summer. Had I of been up on my migration knowledge I probably should have expected to see some pelicans when on a recent trip to visit my brother Dan in Rockford, Illinois. It was all about timing and location. We were on a short “bro” trip to the tiny rural town of Byron not far from Rockford. Rockford itself is about an hour west of Chicago in northern Illinois and Byron is located southwest of town. We took the scenic route which followed the route of the Rock River (the waterway eventually spills into the Mississippi River at Rock Island, Ill.). For a mid-April day it was crappy weather and one which ended up with wind driven white-outs and several inches of snow on the ground. Against this dismal backdrop the big white birds in the river stood out like so many sore thumbs. They were unexpected (didn’t I already say that?) and I shouted out “Pelicans” and waved a pointy finger in their general direction as we passed. I guess I have a tendency to do this kind of thing. I recall a time forty-five years ago when I nearly caused my dad to careen our car off the road when I announced that I’d just spotted a Pileated Woodpecker flying into the tree line. I guess I did more than just announce the fact – I trumpeted. This time, Dan had the grace to act as if what I was saying was true and calmly turned around, although in retrospect it was an un-believable statement (equivalent to shouting Flamingo or Water Buffalo). Fortunately the pelicans I thought I saw were actually pelicans. Spotting these birds made up for some of that foolish April weather. There were about twenty or so birds roosting on a gravel bar, along with an equal number of contrasting Cormorants, and a few were swimming in the gray choppy water. 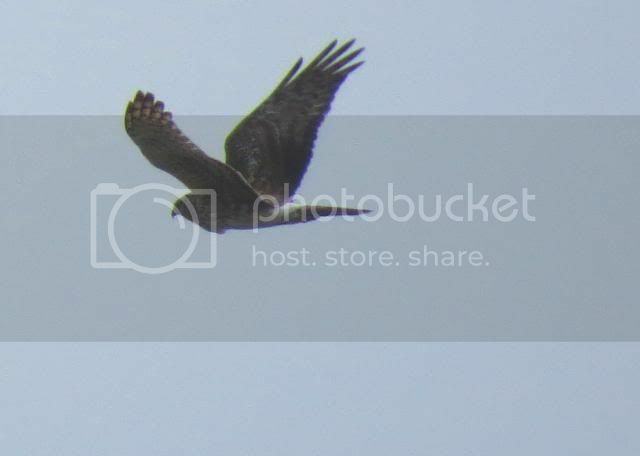 One of them briefly took to the air and displayed the enormous 9 foot wingspan (second largest in North America) and black-edged wings. All were decked out in their breeding plumage. One bird in particular did his best to show off his finery. Actually I say “he” but since both sexes are alike I should just call it Pat or Leslie. 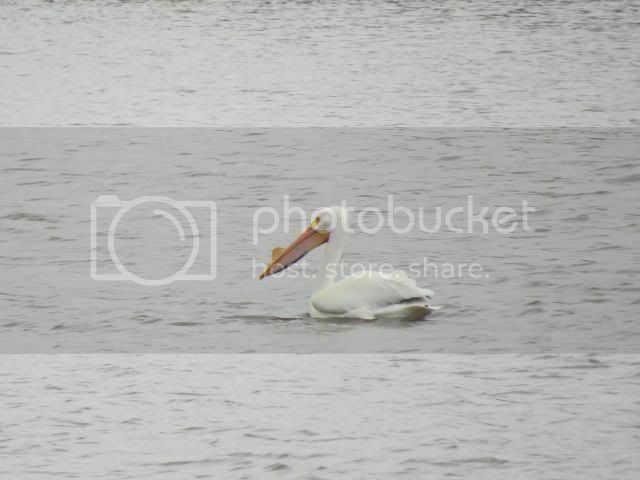 From the light yellow wash on the white body feathers and yellow skin patch surrounding the eye, to the multiple shades of pink, orange, and yellow on the bill the spring coloration of the White Pelican is all about subtlety. A distinctive black patch located dead center on the throat pouch adds a touch of dignity. Add to this a prominent crest and two upper beak projections and you have a unique sight (Yes indeedy do! ).The beak knobs – actually flattened keels – drop off after the season of love ends and the subtle colors fade to basic yellow orange. Although these birds seemed out of place to me, they apparently are a regular sight along the Mississippi Valley during spring and fall migration. 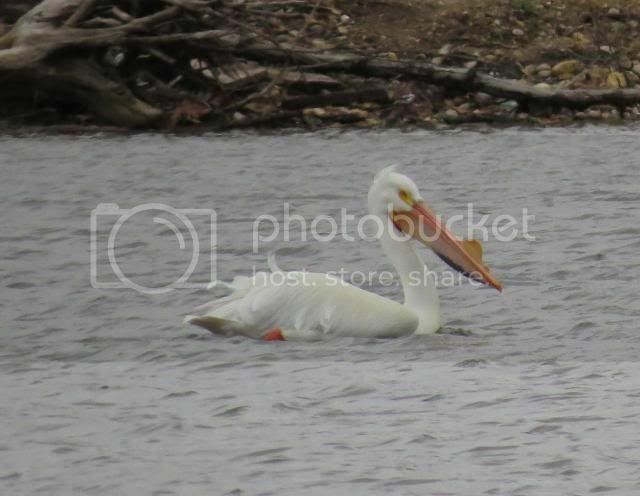 Their appearance is a much anticipated event as the pelicans make their way north from the Gulf to their breeding grounds in the northern plains of Minnesota, the Dakotas, Nebraska, Montana, and Central Canada. They’ll remain for a few days and then move on. 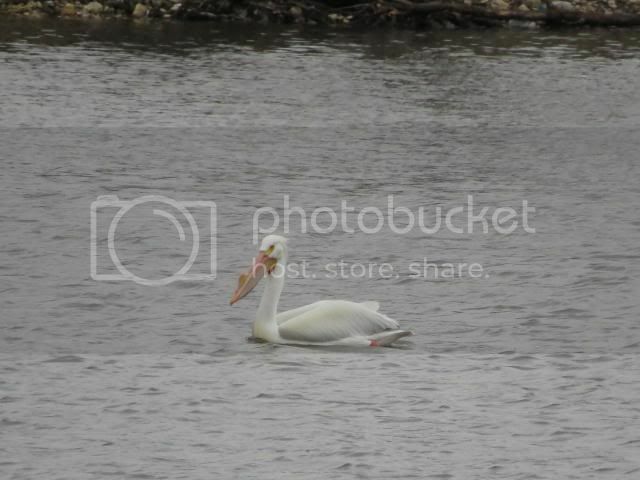 Pelicans are expected around mid-April in Illinois which is exactly when I was there (wow, ain’t it serendipitous). The migrants don’t traditionally venture as far east as the middle Rock River and this really was the only unusual thing about the whole affair. As the birds slowly rebound from their earlier disastrous encounter with DDT they are becoming more common and I – and you – can expect to see more of them in places where you’d least expect them. It was a sparkling early spring morning at Point Mouillee – the kind of day that drives the final nails into winter’s coffin. The shallows of the Huron River mouth were bustling with avian life. A dozen or so Lesser Yellowlegs were probing the silt for tidbits. They nervously bobbed and launched into short twittering flights. 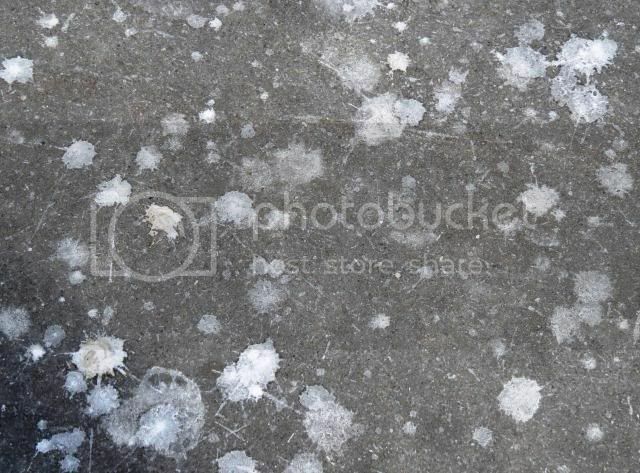 They are animated little creatures – always in a rush to get back to where they started. A few paused to bask in the morning sun and one even allowed itself to doze while balancing on one leg. The energy of the Yellowleg cluster was matched by a flock of Bonaparte’s Gulls. 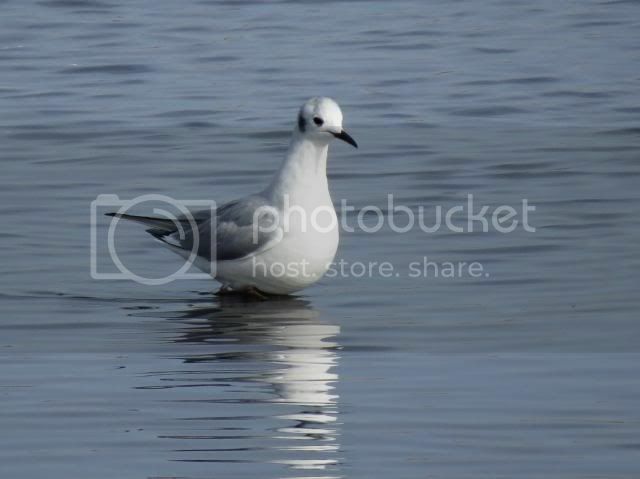 These dainty gulls were also walking the shallows in search of prey (minnows) but due to their short legs they were dragging belly feathers. 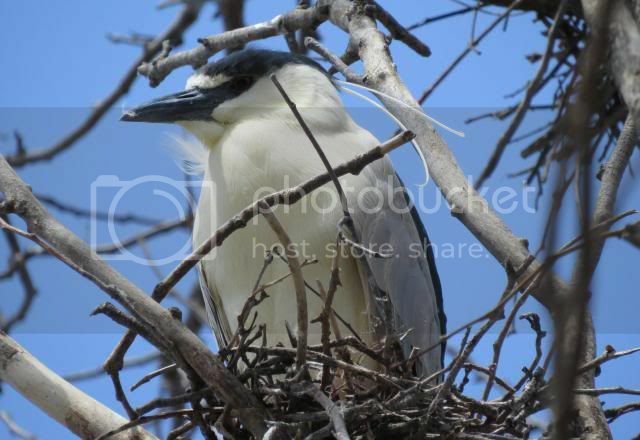 A number of the birds displayed their breeding colors – or, in this case – their stark combination of inky black head, gray back, and white body. 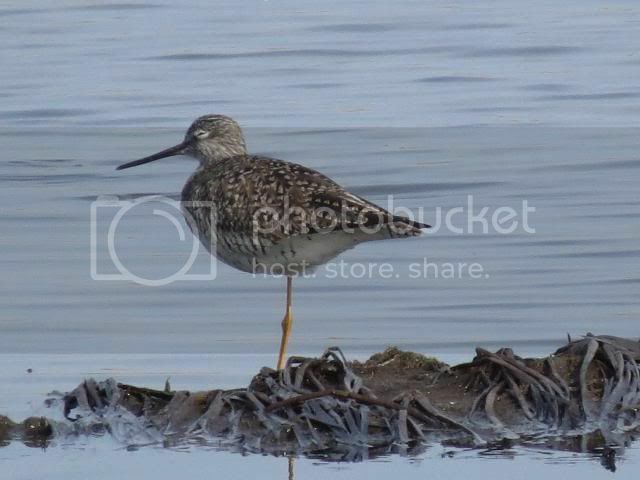 Other birds, like the one pictured here, were still in winterized garb with gray pates and prominent black “ear” spots. Napoleon was not among them. Waterfowl of the duck kind were everywhere. 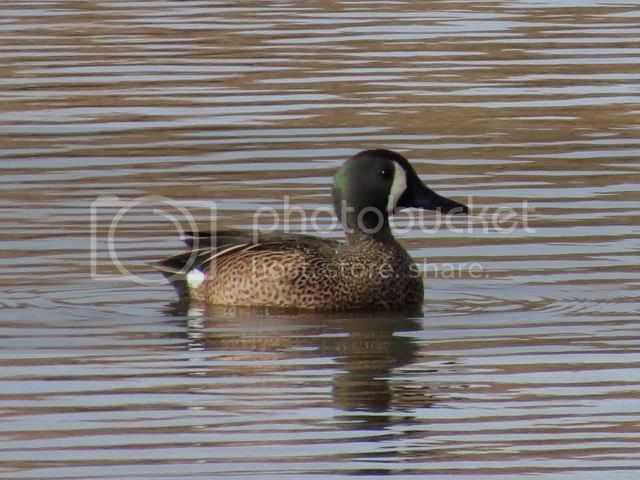 Spastic mini-flocks of Blue-winged Teal (see above) darted back and forth along with Shovelers, Bluebills, Mallards and Coots. And the muskrats were busy doing what muskrats are always doing. They were eating tender aquatic plants and swimming about through the muddy waters. 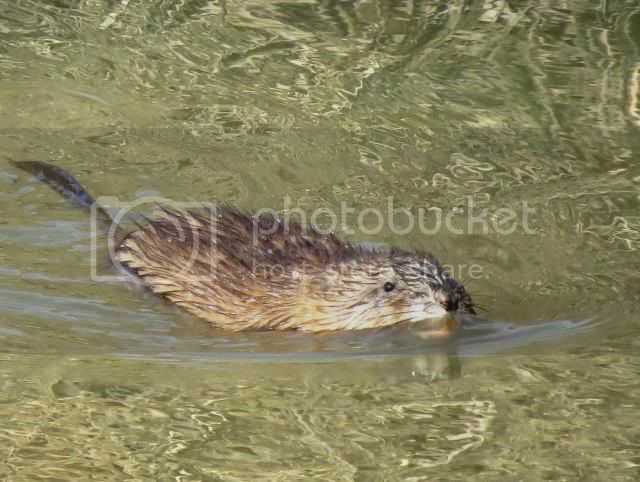 Although most of the aforementioned birds will move on, the Mouillee muskrats remain to swim and eat and swim and…. 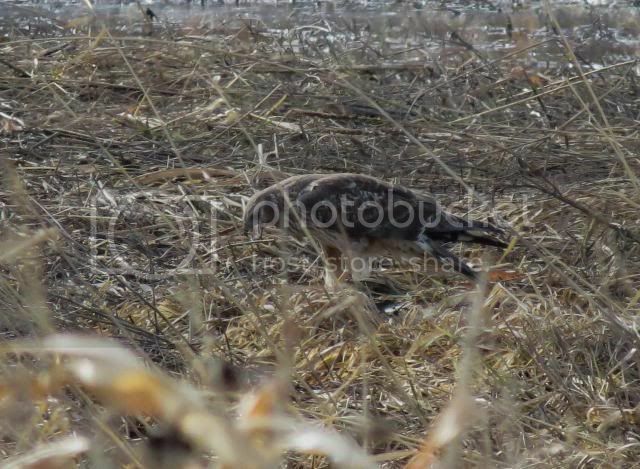 A pair of slow beating wings hovered over all this action in the form of Northern Harriers. 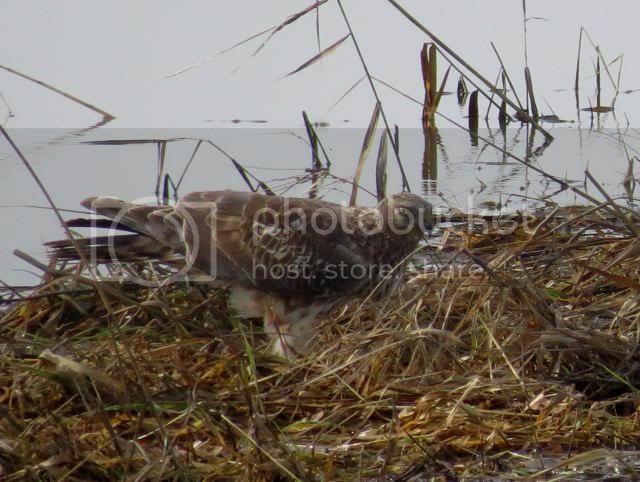 These lanky birds of prey are also a year-round feature of the marshes. They will prey upon muskrats and duck but make most of their living off voles (as well as frogs, snakes, small birds, and even crayfish). The appearance of these two birds did nothing to alarm the yellowlegs or gulls. 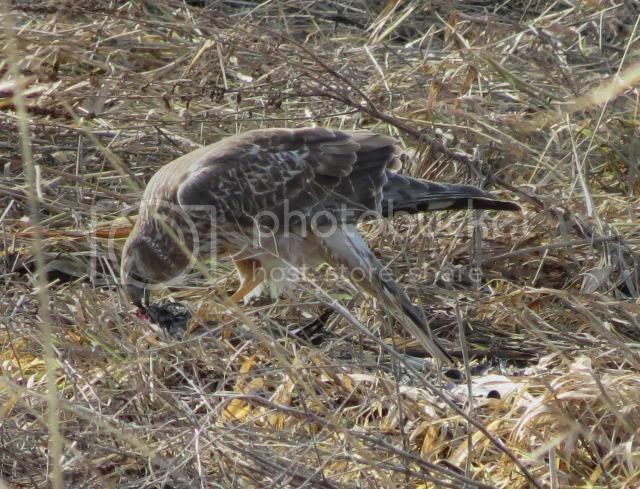 The Northern Harrier is found across the globe and is as common in the reed marshes of England as in the cat-tail marshes of North America (which are becoming reed marshes just like their European counterpart). Derived from the old-English word “to harry, plunder, or ravage” the common name is also oddly applied to track athletes and to rabbit chasing dogs. They do plunder rodent populations but do it because they have to – not because they seek treasures. The genus name Circus is applied to all the world’s harriers and this name makes a bit more sense in that it refers to a circle – as in circling hawks. 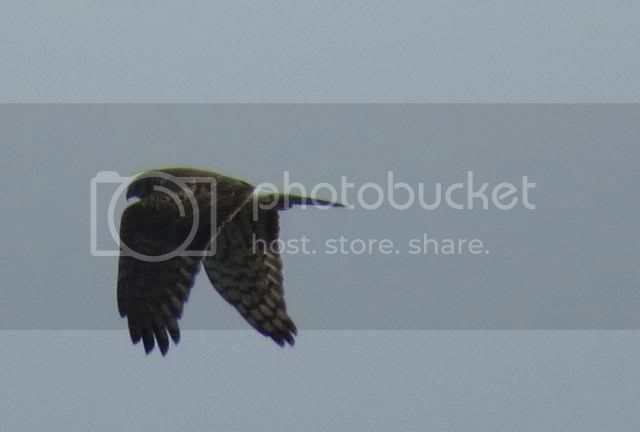 Harriers are easy to identify when in flight. They glide low over the marsh grasses with their wings held at a low dihedral angle. When in sustained glide they rock side to side like giant Monarch butterflies. The wing tips are swept back and pointed, the head small and blunt, and the tail is long and rectangular. Above all, or I should say behind all, they display a white rump patch which is visible from a great distance away. This pair were probably both females, or at the very least immature birds, due their dark coloration. Males are ghostly grey while the youngsters and females are dark. Later one of them revealed a set of yellow eyes and proved to be a female. The birds split up when one continued across the river while the other broke off and descended to the ground as if capturing some hapless meadow mouse on the dike. There it proceeded to rip asunder whatever was held between its sharp talons. They don’t often allow for close approach out here on the open marsh, so it was a treat to be treated to a close look. Up close, Harriers prove to be very different from other hawks. They have extremely long legs (maybe the reason track runners are called harriers? ), small owl-like heads, and dramatically curved beaks. The facial features are explained by the fact that they hunt using a combination of sight and sound. Like owls they use facial discs to listen for scurrying prey. 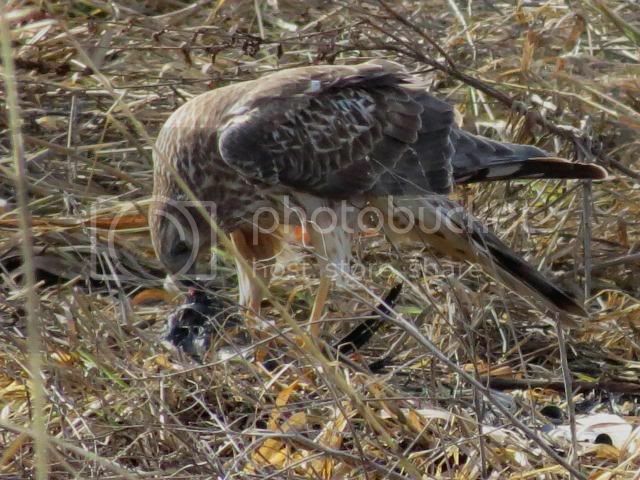 My approach flushed the bird which clutched a chunk of prey as it retreated a hundred yards away to finish its meal. 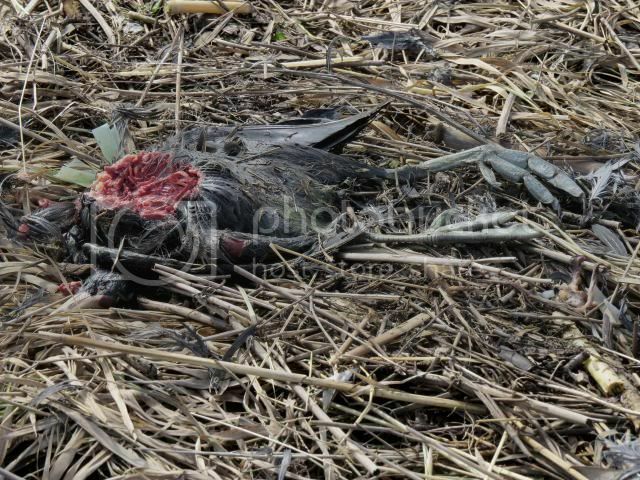 The object of the Harrier interest turned out to be a dead coot. It was a very dead coot that had been long dead before the Harrier happened upon it. Tearing out chunks of the well-aged meat, the hungry predator proved to be a willing scavenger. It was both the grim reaper of life and a picker of bones. 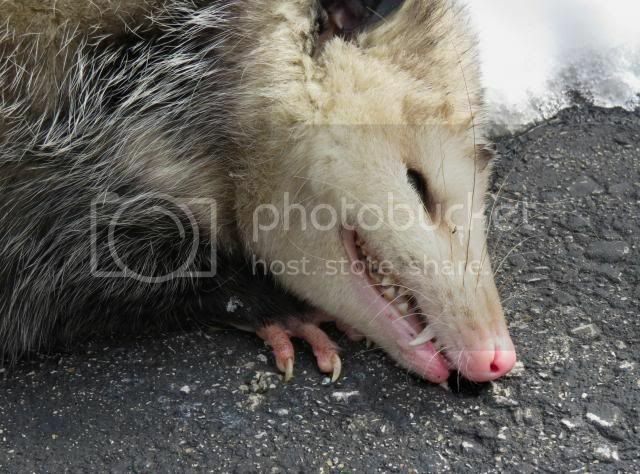 Several years ago I tried to get a live opossum to play dead. After chasing the thing for a half mile through the reeds I was the one who ended up near death with exhaustion. Everything I did – yelling, waving, roaring – failed to convince the animal to shut down. It was a slow motion chase of futility. I later did some reading up and discovered that not all ‘possums are prone to “fainting.” Some individuals, when faced with danger, will drop like a stone and stay dropped for hours, while others will remain stone-faced in the face of adversity. It was just my luck that I’d encountered the latter type of beast. 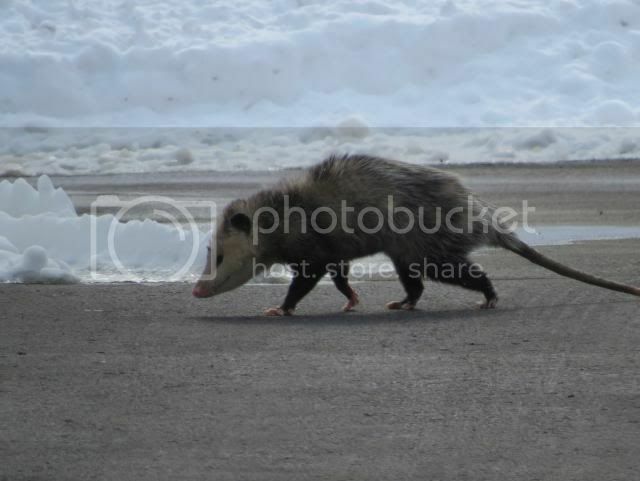 A month ago I came upon another wandering opossum and vowed not to repeat my earlier experience. I slowly approached and snapped a few pictures. It was walking just fine (in the usual pace of a drunken man trying to cross the road) when I first spotted it. Gradually perceiving my approach the creature glanced up with beady eyes and lapsed into death right in front of my eyes. No waving, screaming, or imitating an approaching car was required. Yes, I had a possum playing ‘possum right in front of me and all I had to do was walk up to it. The mortal remains in front of me displayed the frost-bitten ears and scarred tail typical of most northern Opossums. This individual had just gone through a very bad winter indeed. 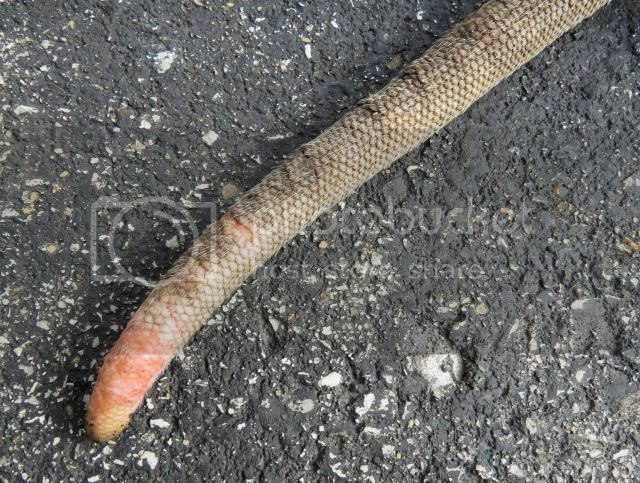 This whole thing reminded me of a similar death routine performed by the Hog-nosed Snake. This critter will roll onto its back, flop out a limp tongue, and even emit a foul rotting smell. Apparently some ‘possums will also emit a stench, although my ‘possum did not. But to get to the point, whenever a “dead” Hognose is flipped right side up it will roll back into the upside down position. Again, this is a case where the animal has some control over its actions but instinct has to follow a rigid script. Dead snakes lay on their back and there is nothing you can do about it. The subtleties of fake death are fascinating. 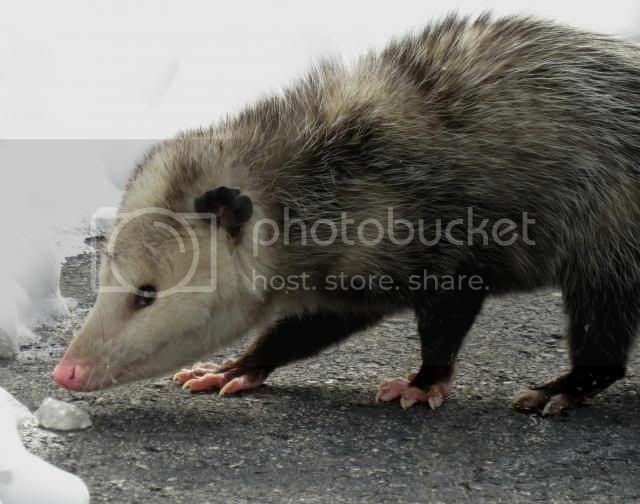 Like the snake, the opossum’s ruse is not totally involuntary. It does not freeze uncontrollably – as some folks will state. The animal’s pulse will drop but the individual is aware of what’s going on and will adjust the act where necessary. These are not the actions of a comatose individual. In fact, since the grimace exposes a formidable array of teeth (opossums have more teeth than any other North American animal) it is possible that this part of the ploy is meant as a form of intimidation and thus the reason it is emphasized. As stated earlier, not all individuals react the same way. Some not only will refuse to faint but will actually hiss and open up their formidable toothy maw as a threat. They never actually carry out this implied threat. Of course, if they did attack then it wouldn’t be a threat any more would it? 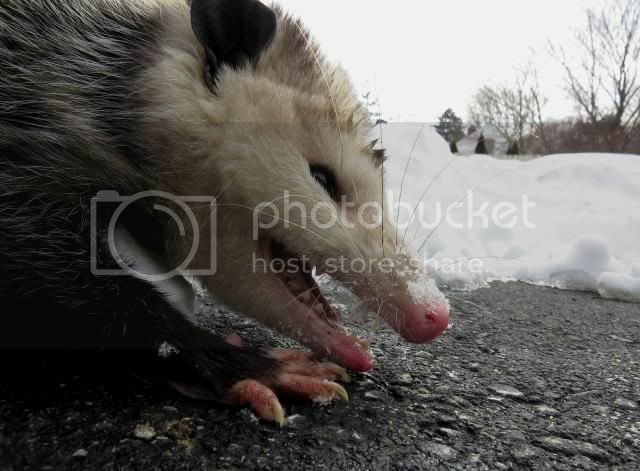 Any attacking ‘possum would soon loose membership in the Marsupials of America Club. This calls into question the whole necessity of feigning death in the first place. It is assumed that going limp will confuse predators who need to kill their own prey. Granted, any fox falling for such a trick would have to be pretty dense. It is likely that the act would only work if it is employed with the full stink, limp, I am truly dead and rotten scheme in action. I ended my interaction with the semi-comatose and somewhat disgusted Opossum and picked it up by the tail and walked it over to the edge of the pavement. 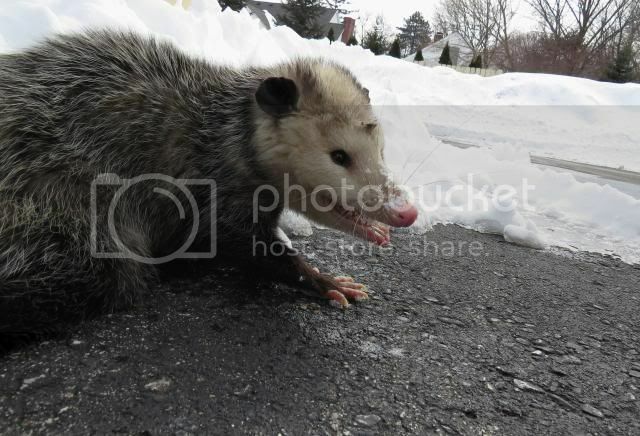 Cars do not recognize the difference between dead opossums, “dead” opossums, and bad actors.